Panerai Luminor Marina 1950 Carbotech™ 3 Days Automatic PAM00661. (Carbotech is a composite material based on carbon fibre, never before used in the world of watchmaking. As well as providing exceptional technical performance, Carbotech has an uneven, matt black appearance, which varies according the cutting of the material: the result is that each example is unique). 44mm carbotech case which is water resistant to 300 meters. Black dial with luminous numeral and dot hour markers. seconds at 9 o’clock. Functions include: Hours, minutes, small seconds & date. Automatic mechanical, P.9010 calibre movement. 31 jewels, 28,800 alternations/hour & 200 components. Power reserve of 3 days. Brown leather strap with white stitching and buckle. Box and papers dated 2017. SKU: 3121073. 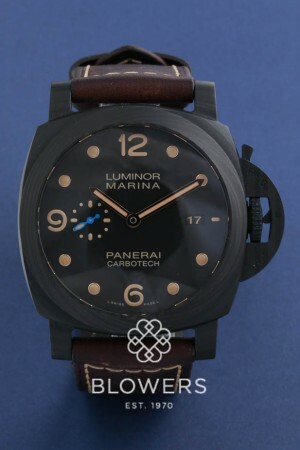 Categories: Luminor, Panerai.